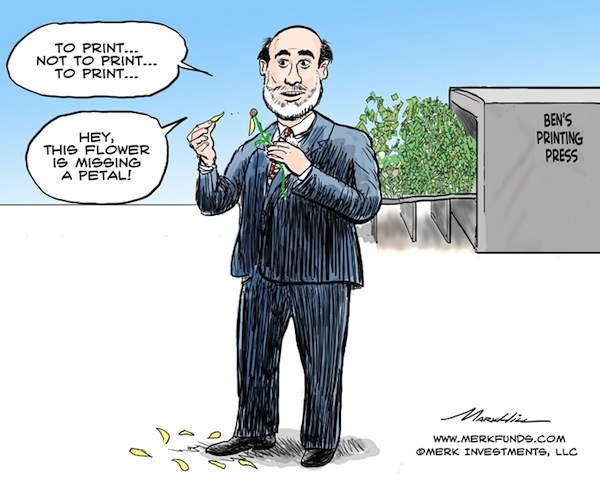 Merk Insights - Bernanke: To Print or Not to Print…? Bernanke: To Print or Not to Print…? To print or not to print? Odds are that Fed Chairman Bernanke has been contemplating this question while drafting his upcoming Jackson Hole speech. The one good thing about policy makers worldwide is that they may be fairly predictable. As such, we present our crystal ball as to what the Fed might be up to next, and what the implications may be for the U.S. dollar and gold. Bernanke has argued that going off the gold standard during the Great Depression helped the U.S. recover faster from the Great Depression than countries that held on to the gold standard for longer. Bernanke is correct: subject to many risks, debasing a currency (which going off the gold standard was) can boost nominal growth. Think of it this way: if the government takes your purchasing power away, you have a greater incentive to work. Not exactly the mandate of a central bank, though. Note by the way that by implication, countries that hold on to the gold standard invite a lot of pain, but have stronger currencies. Fast forward to today and compare the U.S. to Europe. While neither country is on the gold standard, the Federal Reserve’s balance sheet has increased more in percentage terms than that of the European Central Bank since the onset of the financial crisis. Using a central bank’s balance sheet as a proxy for the amount of money that has been “printed”, it shouldn’t be all that surprising that the Eurozone experiences substantial pain, but the Euro has been comparatively resilient. Possibly the most important implication: Bernanke considers the value of the U.S. dollar a monetary policy tool. When we have argued in the past that Bernanke might be actively working to weaken the U.S. dollar, it is because of comments such as this one. This is obviously our interpretation of his comments; a central banker rarely says that their currency is too strong, although such comments have increasingly been made by central bankers around the world as those pursuing sounder monetary policy have their economies suffer from competitive devaluations elsewhere. Bernanke has argued that one of the biggest mistakes during the Great Depression was that monetary policy was tightened too early. Here’s the problem: in a credit bust, central banks try to stem against the flow. If market forces were to play out, the washout would be severe and swift. Those in favor of central bank intervention argue that it would be too painful and that more businesses than needed would fail, the hardship imposed on the people is too much. Those against central bank intervention point out that creative destruction is what makes capitalism work; the faster the adjustment is, even if extremely painful, the better, as the recovery is healthier and stronger. If the policy choice is to react to a credit bust with accommodative monetary policy, fighting market forces, and then such accommodation is removed too early, the “progress” achieved may be rapidly undone. We are faced with the same challenge today: if monetary accommodation were removed at this stage (interest rates raised, liquidity mopped up), there’s a risk that the economy plunges right back down into recession, if not a deflationary spiral. As such, when Bernanke claimed the Fed could raise rates in 15 minutes, we think it is a mere theoretical possibility. In fact, we believe that the framework in which the Fed is thinking, it must err on the side of inflation. As the FOMC minutes were released three weeks after the FOMC meeting, many pundits dismissed them as “stale”; after all, the economy had somewhat improved since the meeting. Indeed, it wasn’t just pundits: some more hawkish Fed officials promoted that view as well. But to make clear who is calling the shots, Bernanke wrote in a letter dated August 22 (the same date the FOMC minutes were released) to California Republican Darrell Issa, the chairman of the House Oversight and Government Reform Committee: “There is scope for further action by the Federal Reserve to ease financial conditions and strengthen the recovery.” Various news organizations credited the faltering of an incipient U.S. dollar rally on August 24 with the publication of this Bernanke letter. For good order’s sake, we should clarify that the Fed doesn’t actually print money. Indeed, printing physical currency is not considered very effective; instead, liquidity is injected into the banking system: the Fed increases the credit balances of financial institutions in accounts held with the Fed in return for buying securities from them. Because of fractional reserve banking rules, the ‘liquidity’ provided through this action can lead to a high multiple in loans. In practice, one of the frustrations of the Fed has been that loan growth has not been boosted as much as the Fed would have hoped. When we, and Bernanke himself for that matter, have referred to the Fed’s “printing press” in this context, referring to money that has been “printed”, it’s the growth in the balance sheet at the Federal Reserve. That’s because the Fed’s resources are not constrained; it’s simply an accounting entry to pay for a security purchased; that security is now on the Fed’s balance sheet, hence the ‘growth’ in the Fed’s balance sheet. Frankly, we are not too concerned about the environment we are in. At least not as concerned as we are about the environment we might be in down the road: that’s because we simply don’t see how all the liquidity can be mopped up in a timely manner when needed. At some point, some of this money is going to ‘stick’. Even if Bernanke wanted to, we very much doubt he could raise rates in 15 minutes. To us, it means the time for investors to act may be now. However, talking with both existing and former Fed officials, they don’t seem terribly concerned about this risk. Then again Fed officials have rarely been accused of being too far sighted. We are concerned because just a little bit of tightening has a much bigger effect in an economy that is highly leveraged. Importantly, we don’t need the Fed to tighten: as the sharp selloff in the bond market earlier this year (and the recent more benign selloff) have shown, as soon as the market prices in a recovery, headwinds to economic activity increase as bond yields are rising. That’s why Bernanke emphasizes “communication strategy”, amongst others, to tell investors not to worry, rates will stay low for an extended period. This dance might get ever more challenging. To lower the interest rate the Fed pays on bank reserves to possibly 10 basis points or zero. We have not seen the third option implemented, but the Fed might be discouraged from the experience at the European Central Bank: cutting rates too close to zero might discourage intra-bank lending and cause havoc in the money markets. As such, expect Bernanke to give an update on his toolbox in Jackson Hole. The stakes are high as even doves at the Fed believe further easing might not be all that effective and could possibly cause more side effects (read: inflation). As such, we expect him to provide a framework as to why and how the Fed might be acting, and why we should trust the Fed that it won’t allow inflation to become a problem. For investors that aren’t quite as confident that the Fed can pull things off without inducing inflation, they may want to consider adding gold or a managed basket of currencies to mitigate the risk to the purchasing power of the U.S. dollar. Please sign up to our newsletter to be informed as we discuss global dynamics and their impact on gold and currencies. Please also follow me on Twitter to receive real-time updates on the economy, currencies, and global dynamics.